Born: 7 May 1837, Stetten, Wuerttemberg, Germany. Died: 4 April 1875, Stuttgart, Germany. Karl (sometimes Carl) Mauch, explorer and prospector, was the son of Joseph Mauch and his wife Christiane Dorothea, born Greiner. He attended the teacher's training school at Gmuend, Wuerttemberg, from 1854 to 1856. As an assistant teacher at Isny (just east of Lake Constance) he set his mind on exploration and started reading travel books and learning some English, French and Arabic. In 1858 he moved to Marburg to become a tutor and for three years studied botany, geology, mathematics, medicine and foreign languages on his own. In 1863 he contacted the publisher A. Petermann, a great benefactor of geographical discovery, who promised him financial support for his planned exploration of southern Africa. Mauch resigned his post that year and spent five months in London improving his English and his knowledge of plants, animals and minerals. As he had little money he travelled to South Africa as a sailor on a German ship, arriving in Durban in January 1865. His "Erster Bericht seiner Reise nach Natal" was published in Leopoldiana (1867/8). After working for some time as a labourer and teacher in Pietermaritzburg he accompanied the trader Carl Pistorius to the South African Republic (Transvaal), arriving in Rustenburg in June 1865. While exploring the district he discovered an outcrop of chromite in the Hex River, which later proved to be of major economic importance. Moving to Potchefstroom he met Friedrich Jeppe*, who was at that time postmaster of the town and working on his map of the Transvaal. With Potchefstroom as a base Mauch explored the Transvaal in all directions, mostly of foot. He kept a journal in which he carefully described the geology and geography of the regions visited, with notes also on natural history and the human inhabitants. On the basis of this information he compiled a map of the Transvaal and sent it to a printer in Cape Town to earn some money, but the reproduction was a failure and he gave his information to Jeppe and Alexander Merensky*. Their map, published in Petermanns Mitteilungen in 1868, acknowledges Mauch's assistance. Merensky later described him vividly: "His sturdy figure was clothed in leather; revolver, compass, sextant, hunting knife and a tin bowl hung from his belt; in his hand was a double-barrelled gun, while its cover and the indispensable blanket were slung on his back" (Rogers, 1937, p. 78). 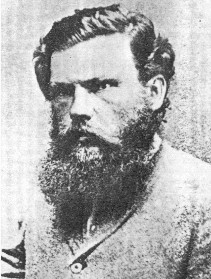 In February 1866 Mauch set out with the elephant hunter Henry Hartley on a hunting expedition through Botswana to Matabeleland (in Zimbabwe), where they reached as far north as 17o S. Mauch studied the geography and geology of this largely unexplored region and upon his return to Potchefstroom in January 1867 sent a report of his observations to Petermann. On 20 March 1867, at the first agricultural show held in the republic at Potchefstroom by the Transvaal Agricultural Society, he won a prize of five pounds sterling for his collection of minerals. He was furthermore at some time elected an honorary member of the society's committee. That same month he again joined Hartley and other hunters on an expedition to Matabeleland, during which he discovered gold near the Umfuli River (east of present Harare). On the return journey he discovered rich gold deposits on the banks of the Tati River (a tributary of the Shashe), near the Botswana-Zimbabwe border. These discoveries were announced in the Transvaal Argus of 4 December 1867. Returning to Durban Mauch bought equipment with money provided by Petermann, and by March 1868 was back in Potchefstroom where he was awarded another prize for his exhibit of ores and minerals. On 8 May he left in search of the ruins of Great Zimbabwe, having been told of their existence by his friend Merensky. He was accompanied by a German engineer, Paul Jebe, and for a while by St Vincent Erskine*. At this time he noted the presence of copper mineralisation at Loolekop, near Phalaborwa. Suffering from hunger and fever Mauch and Jebe eventually reached Inyati, a mission station of the London Missionary Society north of Bulawayo. After recuperating Mauch undertook a brief journey northwards in January 1869 and discovered indications of a gold field along the Umniati River, a tributary of the Zambezi. He was back in Potchefstroom on 15 May. After spending a few weeks on the diamond fields at Kimberley, and failing to find diamonds along the Harts River, he accompanied a Portuguese delegation to Mozambique, looking for the best route to Delagoa Bay (now Baia de Maputo). They reached Lourenco Marques (now Maputo) in August 1870 after a difficult journey through Swaziland, during which he collected much geographical information. A severe attack of fever prevented him from further exploring Mozambique, and forced him to return to the Transvaal. After recuperating in Lydenburg he was back in Potchefstroom in October. From there he visited and described the coal deposits near present Vereeniging. Deciding to try his luck on the diamond fields once more he sailed down the Vaal River to present Windsorton in a small flat-bottom boat, taking the opportunity to map the river more accurately. He returned to Potchefstroom on foot in January 1871. An account of this journey, "Wasserfahrt von Potchefstroom nach den Diamantfeldern am Vaal-Fluss, Dezember 1870 - Januar 1871", was published in Petermanns Mitteilungen later that year. Shortly after his return to Potchefstroom, in February 1871, he completed a map of the hinterland of Delagoa Bay which was published by Forssman (1874). In the winter of 1871 Mauch set off once again in search of the ruins of Great Zimbabwe, which he reached after considerable difficulties on 5 September. Because of resistance by the local inhabitants he was able to visit the site only three times during his nine-month stay in their vicinity. He was the first to describe and sketch the ruins, which he regarded as the remains of buildings erected during the time of King Solomon by people from the Middle East who had come to exploit the region's gold deposits. This and similar speculative theories were widely held until (and even after) 1905, when D.R. MacIver* proved the ruins to be of African origin. Mauch sent a letter with a description of the ruins to Merensky, to be forwarded for publication in Petermanns Geographischen Mitteilungen (1872). Continuing his journey northward in May 1872 he discovered what he called the Kaiser Wilhelm gold-field. Suffering from fever he reached Vila de Sena, a Portuguese settlement on the Zambezi, and from there travelled by boat to Quelimane at the river's mouth. Exhausted and without funds he obtained the help of a French captain to reach Marseilles by the end of 1872 and returned to Germany from there. The king and state of Wuerttemberg gave him a grant to write up his information on southern Africa, and in 1872 he received some recognition for his discoveries from the Royal Geographical Society, which granted him 25 pounds sterling. Preliminary reports on his travels, based on his letters, had been published regularly by Petermann from 1866 to 1872. A more comprehensive account, "Carl Mauch's Reisen im Inneren von Sued-Afrika 1865-1872", was published, with a map, in Petermanns Geographischen Mitteilungen in 1874. This paper included a description of the ruins of Great Zimbabwe. Altogether six of his sketch maps and two proper geographical maps by him were published in Petermanns Geographische Mitteilungen. These maps contained a number of geographical novelties, but were of particular value because they were based on astronomical place determinations. In 1874 Mauch accompanied the naturalist C.E. Otto Kuntze* on an extensive expedition to central America. They visited the West Indies, but as they did not get along well Mauch returned to Germany around the middle of 1874. With no formal qualifications he was unable to find a post in a museum. He finally became a foreman in the Spohn cement factory at Blaubeuren, north Wuerttemberg. However, his health gradually deteriorated and after falling from a window on the first floor in his sleep he died in hospital at Stuttgart. Mauch was an excellent observer and recorder of things that interested him. He was furthermore a good geologist for his time and compiled two geological maps. The first was completed in 1868, after his journey to Inyati. He drew a second geological map in 1871, on a scale of about 100 miles to the inch (1:6 336 000), and sent it to Petermann with some geological sections and notes. It was however not published. In the legend to this map the various formations are arranged in chronological order. Mauch recognised the superposition of the quartzites of the Pretoria Group on the dolomite, and distinguished the granites of the Bushveld Igneous Complex from the widely distributed older granites. He was the first to discover the overall geological structure of the Transvaal and surrounding territories. His earlier geological map was published and described by Harger (1934). Although Mauch is not known to have collected natural history specimens he sent seeds to M.J. McKen* at the Durban Botanic Garden and made some excellent botanical drawings. He was a modest and likeable person, a good athlete, a talented pianist and singer, and a man of great determination and energy. His gold discoveries made him a pioneer of the southern African gold industry, while his cartographic work contributed significantly to the development of geographical knowledge of the region. Mauchsberg, a peak east of Lydenburg, was named after him. Burke, E.E. (ed.) The journals of Carl Mauch: His travels in the Transvaal and Rhodesia, 1869-1872. Salisbury: National Archives of Rhodesia, 1969. Forssman, O.W.A. A guide for agriculturalists and capitalists, speculators, miners, etc., wishing to invest money profitably in the Transvaal Republic, South Africa, 2nd ed. Cape Town, 1874. Reprinted by the State Library, 1984. Foertsch, E. Kartographische und geologische Erschliessung. Lantern, 1992, Vol. 41, pp. 98-102. Harger, H. An early Transvaal geological map by Carl Mauch. Transactions of the Geological Society of South Africa, 1934, Vol. 37, pp. 1-4. Huffman, T.N. Snakes and crocodiles: Power and symbolism in ancient Zimbabwe (p. 2). Wiwatersrand University Press, 1996. Offe, H. Carl Mauch, Leben und Werk des deutschen Africaforschers. Stuttgart: Wuertt. Verein fuer Handelsgeographie, 1937. Wilson, M.G.C. & Anhaeusser, C.R. The mineral resources of South Africa (6th ed., p. 90, 213). Pretoria: Council for Geoscience, Handbook 16, 1998.